Joseph Holloway was born on 21 March 1861. He was an architect and he designed the Abbey Theatre when it was converted from the Mechanic’s Institute in 1904. His architectural career ended in 1912, but he continued his hobby in amassing an enormous collection of theatrical ephemera, including playbills and newspaper cuttings, until his death in 1944. Holloway attended an extensive number of plays in venues around Dublin during his lifetime, such as the Abbey, the Antient Concert Rooms and the Queen’s. He kept a record of each performance in his Impressions of a Dublin Theatregoer 1895-1944. 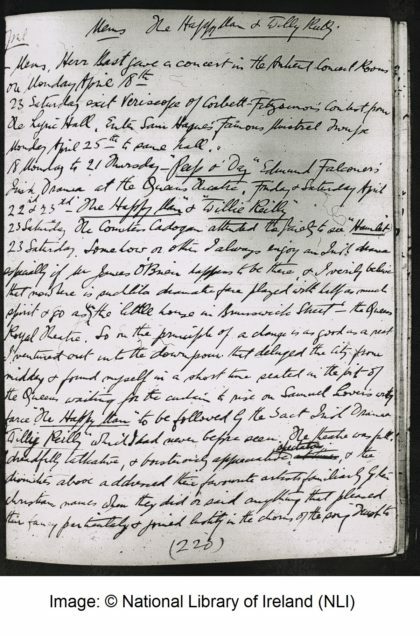 The Impressions were, on Holloway’s death, donated to the National Library of Ireland and a portion of the Impressions, from 1895 to the end of 1924, have since been transferred to microfilm, on the assumption that these are the parts of the manuscript most likely to be of interest to scholars. This selection appears in the National Library’s microfilm directory under the collection title ‘Manuscripts of the Irish Literary Renaissance,’ which provides manuscript sources pertinent to the Celtic revival of the late nineteenth and early twentieth centuries, of which Holloway was a key observer. The first challenge in the course of this project, was the navigation of the manuscript, which, considering the size of even this reduced corpus, was not an insubstantial challenge. Helpfully, Holloway’s manuscript provides a ramshackle navigational apparatus, which in theory provides a reliable means of surveying it. Holloway has numbered every page of the diary, and provides a contents section, in which each theatrical venue appears as a heading, as in a conventional index. Beneath this heading, the production that Holloway saw there is provided, next to the page number in which they appear in the diary. 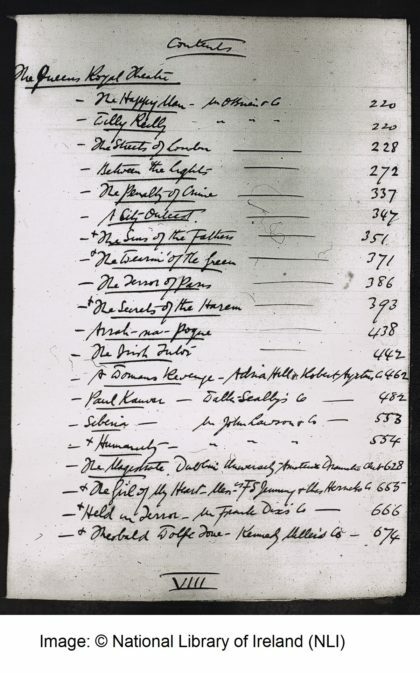 Despite how closely Holloway’s manual method of pagination might emulate the resources of a contents page in a printed text, his system is not conclusive. 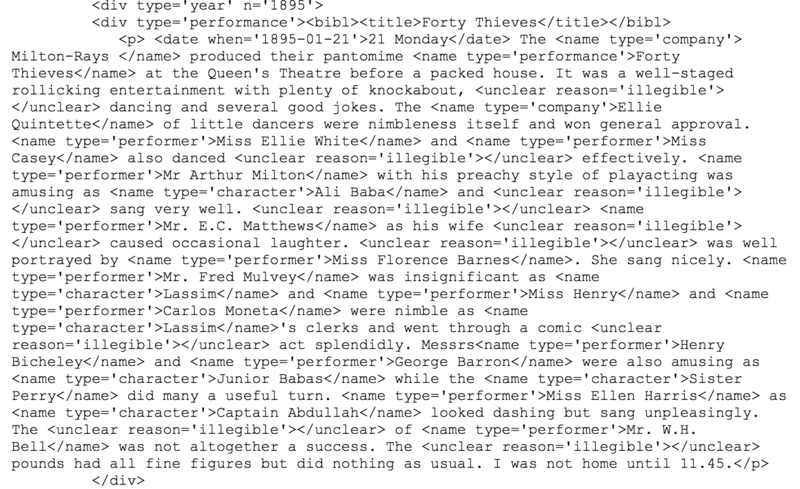 From the size of the corpus and how active Holloway was in Dublin theatrical life at the time, it is reasonable to assume that there are many instances in which the Queen’s Theatre is mentioned which are not included under the heading ‘Queen’s Theatre’ in the contents section. Rather than transcribing every instance that Holloway mentions the Queen’s, it was decided that this project would be limited to instances in which a Queen’s performance is mentioned in the contents page and attached to a particular page number. Navigating the corpus without this means of signposting would have been too time-consuming a task otherwise. The Impressions are in some respects consistent and maintain a number of key features which aided the process of navigating them during the project’s appointed time-frame. However, they are also a dynamic resource and undergo changes as Holloway’s methods of journal-keeping change. Firstly, they get longer as time goes on. It was decided at the start of the project that every account of a production at the Queen’s would be fully transcribed and marked up in TEI and if a particular volume did not have a contents page, they would be ignored and left for a future transcription of the Impressions. Even with this reduced scope, the transcription of every year from 1895 to 1924 was over-ambitious. This may have been feasible if the resource stayed within the length of the 1895 volume of five hundred or so pages, but by 1900, each volume is at least 1500-1700 pages. Initially, Holloway’s reviews were succinct, in that he provided the names of actors, the names of the characters that they portrayed, a few sentences on the quality of the performance in general and the audience’s reaction to it. This would typically take up no more than a page or so of the manuscript. However, around the year 1900, Holloway’s notes became more extensive. Descriptions of a production begin to run to a length of three to five pages. Holloway also provides caricatures of actors, accounts of people he has seen or spoken to around Dublin, correspondence, and deaths. These eventually become so prevalent and numerous that they are indexed as a category in their own right, (‘Miscellaneous’) in the contents section. This is why the decision was reached to transcribe the resource in yearly multiples of five, 1895, 1900, 1905, 1910, 1915 and 1920. This would firstly provide a deliverable of six years of the Queen’s Theatre’s history and secondly, a representative sample of the political and social milieu of Dublin society during a number of turbulent years in its history. However, in the year 1913, Holloway abandons pagination as a means of navigating the Impressions. Instead, Holloway’s indexing schema depends upon dates. Furthermore, the contents section appears at the end of the volume, rather than at the beginning. This would not necessarily be an issue if the dates provided in the index were not different from those which appear in the manuscript. In some volumes, the index is not present at all. These changes present an obvious difficulty as they offer the sole means available to navigate the resource. Holloway occasionally returns to this method of navigation via date, but this occasionally controverts the dates in the manuscript proper. A wholly speculative reason for this change is that Holloway writes his diary entries on a day subsequent to the date of the actual production. The date provided in the index could therefore be the ‘real date,’ on which the performance took place, whereas the date that the entry begins with is the date on which the entry was written. This led to the exclusion of a number of years from the transcription. The Queen’s section from the 1896 volume was transcribed in their place. The resource’s index was therefore inconsistent and unreliable. While they initially provided a secure means of locating information pertinent to the Queen’s Theatre, this did not remain the case. It is another matter of speculation (or perhaps wishful thinking), as to whether a more secure means of navigating the resource exists somewhere in the Impressions manuscript, or in Holloway’s larger collection of theatrical memorabilia which were not microfilmed at the same time as the manuscripts. It is recommended therefore, that were transcription of the Impressions to take place outside of the realm of crowdsourcing the transcription of high-res images, would be done through use of the manuscript, so as to minimise the impact of the vicissitudes of this protean resource on the process. We hope to find in Ireland an uncorrupted and imaginative audience trained to listen…and that freedom to experiment which is not found in theatres of England, and without which no new movement in art or literature can succeed. We will show that Ireland is not the home of buffoonery and of easy sentiment, as it has been represented, but the home of an ancient idealism. It would be a mistake to take Yeats’ pronouncements in this statement of intent at face value; his phrase ‘buffoonery and…easy sentiment,’ more accurately reflects Yeats’ own prejudices regarding popular culture than the tastes of the average Irish playgoer. Yeats also takes little account of Dublin’s theatrical milieu, being as it was, a city highly permeable to cultural influences from abroad. This was a consequence of theatre managers such as Michael Gunn in the Gaiety, and J.W. Whitbread in the Queen’s Theatre, moving away from the traditional business model of having just one theatrical company in residence. Instead, they began to allow touring companies to rent the theatre for a pre-determined ‘run’. This allowed Dubliners access to performances as heterogenous as Soderman, Wagner and Gilbert and Sullivan, and their omission from the Abbey’s manifesto attest to how irredentist Yeats’ dramatic aspirations were. Superior people sneer at what they consider the crude and melodramatic pictures of ’98 and other periods of Irish history which from time to time are presented in the oldest and most historic theatre in Dublin [the Queen’s]. For the most part they are critics who have never witnessed the wonderful influences which even a very plainly-told story of Irish patriotism has on the minds of the honest working-men and working-women of Dublin. One would not wish to outline a condescending and dubious narrative along the lines of a ‘people’s history’ of the Dublin stage as a curative to the excesses of Yeats’ account, but one is likelier to derive a more nuanced sense of theatrical life in Dublin from the above than from accounts from inside Yeats’ confrontationally exclusive national theatre. Annie Horniman, the patron of the Abbey at its outset, had demanded that the theatre keep its prices high, in order to avoid the staging of ‘cheap entertainments’. This contrasts with the Queen’s policy of tiered pricing, based on distance from the stage, and in making half-price tickets available past a certain point in the evening. Horniman’s wishes were unlikely to be at odds with Yeats’, as he frequently expressed contempt for ‘the average theatregoer, who is hated by both of us [Yeats and Gregory]’. In the Abbey, the audience was also expected to sit in silence during the performance. This is not to say that they always did, of course, but this expectation nevertheless represents the opposite of the theatrical experience of the Queen’s, in which audience participation, the hissing of the villain and the throwing of orange peels at inferior actors, was fundamental to any given performance. Yeats’ belief that his national theatre was crucial in developing a national consciousness or sensibility as a prelude to the Easter rebellion can be related to his faith in the Abbey as an embodiment of the new, idealistic spirit of the Irish nation, especially in the aftermath of the Irish Parliamentary Party split. This is not only in the sense that both are somewhat dubious hypotheses, but that they were arrived at retrospectively in the drafting of his Memoirs . It is in a moment of characteristic self-regard, therefore, that Yeats poses the question ‘Did that play of mine send out/Certain men the English shot?’ in his poem, ‘The Man and the Echo’ . It was in fact the Queen’s Theatre that directly engaged with the rebellion in its immediate aftermath, by staging incendiary and overtly nationalistic material. As Christopher Morash suggests, the very gesture of founding ‘a national Irish theatre’ sets the Abbey in opposition to the dramatic tradition represented by establishments such as the Queen’s and Smock Alley Theatre, in staging melodramatic plays which took Irish history as its subject. Typical among which were texts that Whitbread would have written, while managing the Queen’s. ‘Buffoonery and easy sentiment’ of this kind therefore emanates from more consistent and engagé framework than the supposedly novel strain that Yeats initiated in his work written for the Abbey. By couching his rhetoric in the development of an unprecedented national consciousness, Yeats also moves to delegitimise the work of playwrights such as Whitbread and Hubert O’Grady because of their supposed inauthenticity. It should be noted that it was Whitbread’s take on this rebellion, Lord Edward or, ’98, produced at a time which subversively grappled with the charged political climate of the late nineteenth and early twentieth centuries (it was frequently revived) and not Gregory’s Cathleen Ní Houlihan that Holloway declared to be ‘the sort of play…that will ultimately put a new spirit into Ireland’. Despite Yeats’ insistence on a strict division between the popular theatre of the Queen’s and the non-representational ‘high’ literary Abbey, these two institutions are not in opposition to one another. Seán O’Casey’s Dublin Trilogy clearly owes a debt to popular traditions of his time, not only in his original scripts but in his drama as a praxis; actors who performed in them on the Abbey stage were likely to have had experiences of acting in the Queen’s. It is therefore necessary to see the relationship between these two theatres on either side of the Liffey, indeed, in the network of Dublin’s theatrical venues of the time, in conjunction with one another, in order to nuance our perspectives on both. One could, for example, take account of the fact that for many playwrights rejected by the National Literary Society’s reading group, the Queen’s Theatre offered a potential second destination, as was the case for James Cousins, and his play Sold . The international context in which the Queen’s operated might also be considered as the field develops; Whitbread sought the Lord Chamberlain’s approval for his plays, so that they could be included in a touring repertoire, which travelled to most urban centres in England, such as London, Manchester, Bristol, and sometimes as far afield as New York or Sydney. The range of these tours is attributed by Cheryl Kerr to the marketing of the plays as authentic Irish theatre, but she mentions also the influence that the war had on the touring theatre market. The loss of English acting troupes in the mass mobilisation of the first world war created new employment opportunities for Irish companies, such as Whitbread’s Kennedy-Miller Company. These dimensions, briefly outlined, could be furthered in any number of distinct ways, which might eventually characterise the Queen’s Theatre in a different light, one which does not depend on its current image within the secondary literature as a marginal irrelevance for the staging of consensus drama, or a venue for parochial sentimentality. Text encoding is a means by which text is made legible to a computer by marking it up in a text-editing program, through use of a mark-up language based on the formal structure of XML. A text that is marked up in this way, must be ‘well-formed,’ meaning that it must be free of errors. This is achieved by dividing the text into non-overlapping hierarchical elements, as in the basic example below. The imposition of an unambiguously hierarchical structure may sound like anathema to scholars of the humanities, as it seems as though this violates one’s responsibilities as a humanist, in remaining open to various perspectives, and avoiding the single-minded devotion to one interpretation at the expense of others, especially within an editorial context. These concerns should be taken seriously, and borne in mind when embarking on any text-encoding project, but as Johanna Drucker and Bethany Nowviskie write, ‘in order to enact the necessary day-to-day ‘job’ in front of us, bracketing out the (sometimes egregious) assumptions that allow computational methods…to operate effectively,’ may at times be necessary. One would not wish to give those who remain sceptical the impression that the raison d’être of the TEI-C is to standardise objects of study and to settle the matter of textual ontology definitively. Rather, it is demonstrably the case that the TEI-C is a progressive organisation, always ‘on the move’ in its responses to the wider TEI community’s perceived needs, which has led to the code being changed and adapted since the TEI-C’s founding in 1987. Such changes involve additions of particular elements to the language, or the modification of those which already exist. In this way, the TEI-C has objectively benefitted from the input of literary critics, rather than seeking to shut them out in the perpetuation of some utilitarian enterprise. Methodological difficulties remain however, especially in relation to this requirement for well-formed documents. For example, the removal of overlapping hierarchies can be problematical, as texts are often composed of numerous structures which overlap, as in the case of, for example, a poem that runs over the length of one particular page. This is one difficulty that a would-be encoder must contend with, depending on the nature of the project that she undertakes. The TEI-C also provides an extensive set of guidelines for the language’s usage, which includes detail relating to the proper structure of a document’s metadata, a list projects which have made use of text encoding, and dictionaries of potentially obscure vocabulary, ensuring that the consortium operates transparently, and in such a way that would allow any aspiring encoder to benefit from an extensive body of practice-based expertise. What follows is an account of how this method of encoding was used in the context of this project, and how it determined the shape of the TEI document, 31,000 words in length, which was produced in the course of this project. In determining this project’s scope, it was decided that the content of Holloway’s manuscript was of greater pertinence to the project than the manuscript itself. Therefore, features such as line breaks, ink blemishes and annotations are not marked-up within the code, which the TEI-C makes provision for, as part of its extensive repertoire of elements. This elevation of the content over the manuscript’s form was a significant decision made in the early stages of the process, and irrevocably determined the shape of the end-product. Holloway’s use of punctuation is often inconsistent. His periods, commas and hyphens appear interchangeable, if they are used at all. His spelling is also uneven, for example, for the word ‘Sisyphus,’ Holloway writes ‘Sisiphus’. As a result, his syntax is jumbled, and the meaning is often difficult to discern. It was decided that Holloway’s punctuation and spelling would be corrected in order to preserve the sense. These corrections are made silently, meaning that they have not been declared within the TEI code, as the generation of a ‘genetic’ electronic edition, a text encoded in such a way that allows for variants of a manuscript to be visualised simultaneously and therefore read in tandem with one another, was not relevant to the project. The TEI header is the place in which a TEI document’s metadata is stored, as well as other general information concerning the wider project of which it formed a part. It was here that the rationale for determining the selection of pertinent excerpts was declared, for the benefit of anyone who might make use of the mark-up schema, or the document itself, in the future. The document’s full title was: ‘Excerpts from the Manuscript of Joseph Holloway’s ‘’Impressions of a Dublin Playgoer’’ from the years 1895, 1896, 1900, 1905 & 1910 as regards the Queen’s Theatre.’ Joseph Holloway was encoded as the author, and his birth and death dates were provided, as is customary. The American Microfilm Company, the entity responsible for converting the Manuscripts of the Irish Literary Renaissance to microfilm, were also given authorial credits. ’Chris Beausang’ is named as the document’s editor and transcriber. Within the manuscript itself, each date, performance, actor, playwright and company was marked up using the relevant elements, as in the below example. 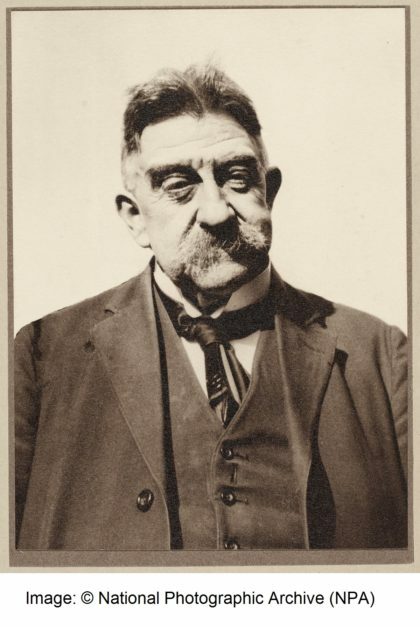 <name type=”performer”>Messrs Henry Bicheley</name>&<name type=”performer”>George Barron</name> were also amusing as<name type=”character”>Junior Babas</name> while the <name type=”character”>Sister Perry</name> did many a useful turn. As one can see, @type attributes are used in each case in order to specify the variety of name that was being used. It should be noted that playwrights were a porous category within this project, as playwrights often acted within their plays. Which category a particular element fell into was determined on a case by case basis. ‘Performer’ is also a fluid delineation, and was extended to those whom Holloway notes as responsible for the scenery. Each year, an account of an individual production, is contained within a separate element, as in the below example. As is standard practice, <p> is used to convey the actual content of Holloway’s entries. This has the serendipitous effect of emulating Holloway’s method of formatting, as he never uses paragraph breaks inside a single entry. When Holloway’s handwriting was too difficult to decipher or the ink he used resulted in a word’s sense being obscured, the ‘unclear’ element was used, as in the example below. The unclear element is therefore a useful one and will allow those who wish to build on this project to fill in the gaps more easily. The aim of this project was, ultimately, to pave the way for future work that may be done, whether this be in the form of a crowdsourced initiative around the manuscript, in the same manner as Transcribe Bentham, or the Letters of 1916 project. A digital scholarly edition of some kind produced through different means may also be possible. It is conceivable, therefore, that this transcription’s schema, which was decided upon provisionally in the early stages of engagement with the manuscript, will merely be a preliminary or antecedent to whatever future the manuscript will have in a digital context. This seems like the most likely avenue to full publication for the Impressions if this is ever to happen, based upon the variegated nature of their contents, and the extent to which they contain visual sources of different forms such as playbills, newspaper clippings and doodles of members of Dublin society. Otherwise, it is likely that Holloway will only be quoted in selective or restrictive contexts, as in the case of the Proscenium Press publication, which included selections from his entries relating to the Abbey, or by theatre historians seeking eyewitness testimony for their own research, Holloway being one of only a few who can provide eyewitness evidence of many productions. A fully marked-up, digitised version of the Impressions would allow potential scholars greater access to the manuscript and would thereby further the research of any would-be theatre scholars,. It would enable also, an unprecedented level of engagement with the manuscript through digital means, as the text would be subject to faster and more powerful searches, the automated construction of concordances, or even visualisations based on relationships between particular entities. Drucker, Johanna and Nowviskie, Bethany, ‘Aesthetic Provocations in Humanities Computing,’ in Schreibman, Susan, Siemens, Ray and Unsworth, John (Editors). 2004. A Companion to the Digital Humanities Blackwell Publishing. ‘The Text Encoding Initiative and the Study of Literature,’ in Schreibman, Susan, Siemens, Ray and Unsworth, John (Editors) 2007. A Companion to Digital Literary Studies. Blackwell Publishing. Dickson, David. 2014. Dublin: The Making of a Capital City. Profile Books. Foster, R.F. 1989. Modern Ireland 1600-1972. Penguin Books. —. 1997 W.B. Yeats: A Life I The Apprentice Mage 1865-1914. Oxford University Press. —. 2003. W.B. Yeats: A Life II The Arch-Poet 1915-1939. Oxford University Press. —. 2014.Vivid Faces: The Revolutionary Generation in Ireland 1890-1923. Allen Lane. Joyce, James. 1986. Ulysses. Gabler, Hans Walter, Steppe, Wolfhard, Melchior, Claus (Editors). Vintage Books. Grene, Nicholas. 2002. The Politics of Irish Drama: Plays in Context from Boucicault to Friel. Cambridge University Press. Herr, Cheryl. 1991. For The Land They Loved: Irish Political Melodrama 1890-1925. Syracuse University Press: 1991. Lonergan, Patrick.‘Archiving the Next Play,’ The Theatre of Memory Symposium, The Abbey Theatre. Morash, Christopher. 2002. A History of Irish Theatre 1601-2000Cambridge University Press. Schreibman, Susan, Siemens, Ray and Unsworth, John (Editors). 2004. A Companion to Digital Humanities. Blackwell. Schreibman, Susan, Siemens, Ray and Unsworth, John (Editors). 2008. A Companion to Digital Literary StudiesBlackwell. Watt, Stephen, Joyce, O’Casey and the Irish Popular Theatre (Syracuse University Press: 1991). Yeats, W.B. 1953. The Collected Plays of William Butler Yeats. Macmillan and Company. —. 2008. The Collected Poems of W.B. Yeats. Wordsworth.